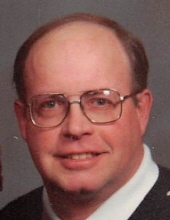 Guy “Bill” Doud, age 70 of Kellogg, Iowa, died after a two year long battle with cancer on Saturday, March 30, 2019 at the Mayflower Community Health Care Center in Grinnell and under the care of Grinnell Regional Hospice. A private family graveside service will be held on Wednesday, April 3, 2019 at Rock Creek Cemetery west of Grinnell with Rev. John Epperson officiating. Bill's family will receive friends from 1:00 p.m. until 3:00 p.m. on Wednesday at the Kellogg Park Shelter House. Visitation will begin at 2:00 p.m. on Tuesday at the Smith Funeral Home in Grinnell. His family will receive friends from 4:00 pm until 7:00 pm. In lieu of flowers, memorials may be designated to the Bill Doud Memorial fund to benefit the Mayflower Community in Grinnell and the Unity Point Infusion Center, mailed in care of the Smith Funeral Home, PO Box 368, Grinnell, Iowa 50112. Memories and condolences may be shared with the family at www.smithfh.com. Guy William “Bill” Doud was born June 26, 1948, the son of Doris Doud and Guy Slaven. Bill was raised by his grandparents, Pete and Hazel Doud, in Rock Creek Township until age 10 when they moved to Kellogg, where he attended school. He graduated from Newton High School in 1966. In 1972, he began working for Farmer’s Co-op Elevator in Kellogg in a “temporary” job that would last 46 years until his retirement in December 2018 from Heartland Co-op. Bill was known as the “go to” guy for hundreds of area farmers for his hard work and customer service, often on his own time. He was interested in all things ag, especially sprayers, and enjoyed reading farm publications and watching RFD-TV to keep up on industry changes. In 2018, Bill married Pam Gruhn after 33 years together. Bill and Pam enjoyed many family gatherings, parts runs and day trips throughout the countryside, outdoor projects on their acreage, and tinkering with his large collection of tools and equipment. In his younger years, Bill also played baseball, league bowling, and entered regional and national archery tournaments. Bill is survived by his wife, Pam Gruhn; mother, Doris Flanagan; brother, Steve Slaven; step-siblings, Kenny Flanagan, Barbara Rahimi and Patty Miller; his “musketeer” cousins, Marla Modlin and Marcia Murty; many nieces, nephews, cousins and friends; and his special companion (cat), Rastas. He was preceded in death by his grandparents; his father; and sister, Brenda Slaven Thorn. Pam and Bill are grateful to those who supported them throughout the past two years, especially the Heartland Co-op “family” in Kellogg; special friends and family who visited and reminisced; Mayflower and Unity Point hospice staff for care and compassion; and Dr. Heddinger and staff, Surgical Associates and staff, and UnityPoint/GRMC infusion center for their guidance. To send flowers or a remembrance gift to the family of Guy "Bill" Doud, please visit our Tribute Store. "Email Address" would like to share the life celebration of Guy "Bill" Doud. Click on the "link" to go to share a favorite memory or leave a condolence message for the family.